This App provides a single, a twin, a week-based and an annual calendar. It just displays calendar months, and NO events (appointments). Additionally, it is capable of multitasking on a newer iPad (Slide Over and Split View). The calendars are shown in the device's language and according to the region's rule applied to it. Calendar range: January 1583 - December 3000. 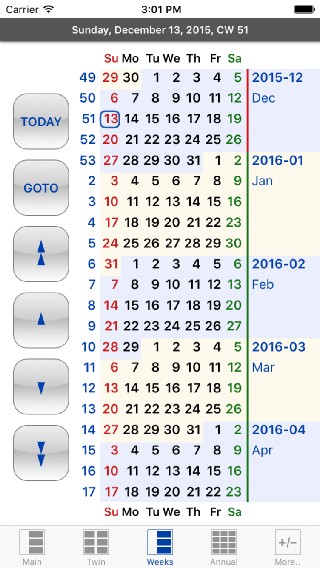 In the FREE version, the calendars show only the recent 24 months including the next quarter. Jump to an arbitrary month directly (until December 2999): Please use the GOTO button or double-tap on a calendar.